My life has officially been divided into two eras. The pre-Roasted Sunchoke Soup era was decidedly less delicious. I’ve now entered the Golden Age of knowing just how flavorful and interesting sunchokes are! Imagine a potato that has the flavor of an artichoke. Sounds incredible, right? Well friends, that’s what sunchokes taste like! There’s also the distinct possibility that everyone knows about these delightful things and I am just a few years late to the party. But if you are like me and just discovering sunchokes for the first time, you should know they are also sometimes called jerusalem artichokes. I highly recommend you pick some up immediately to make this amazingly creamy and comforting Roasted Sunchoke Soup. It’s sooooooooo good, you guys! Pro tip! Sunchokes can be quite knobby like ginger. I recommend buying ‘chokes that don’t have really pronounced knobs as those take longer to peel. This Roasted Sunchoke Soup was inspired by a soup I had at Little Pine, here in Los Angeles. It’s Moby’s super awesome vegan restaurant that also donates 100% of proceeds to animal welfare organizations! The food and service is top notch and the whole experience is only made better knowing each purchase is going to help animals. But this soup, this SOUP! I had to try to make it myself and I’m so happy I did! This Roasted Sunchoke Soup will absolutely be part my fall/winter staples. It’s super simple to make, with only 10-15 active minutes. Seriously, if you want to impress your friends and family with your culinary talent while making it look effortless, this hearty Roasted Sunchoke Soup is a MUST TRY. It’s hearty, comforting, creamy, and packed with flavor. What more can you ask for in a soup? If you try this Roasted Sunchoke Soup, be sure to leave a comment and tag a photo with #carrotsandflowers on Instagram! We love to see what you come up with. Have a Happy Thanksgiving Week and stay tuned for a 5 Layer Thanksgiving Pot Pie we are sharing tomorrow! A warm, comforting vegan soup packed with flavor. Roasted sunchokes blended with cashew cream, topped with balsamic glaze and toasted hazelnuts. Soak the cashews for 3 hours or boil for ten minutes to soften, then drain. Preheat the oven to 400. On a baking sheet, combine the sunchokes with the shallots, thyme, olive oil, and 1/2 tsp salt. Roast for 30 minutes at 400F. Meanwhile, combine the soaked cashews in a blender along with the garlic, lemon juice, pepper, optional nutritional yeast, 1 cup vegetable broth, and the remaining 1/4 tsp salt. Blend on high speed for 1-2 minutes until smooth. When the sunchokes and shallots are done roasting, immediately transfer them to the blender. Blend on high for an additional 3-4 minutes. If the soup is too thick, add vegetable broth a few tablespoons at a time until you reach your desired consistency. 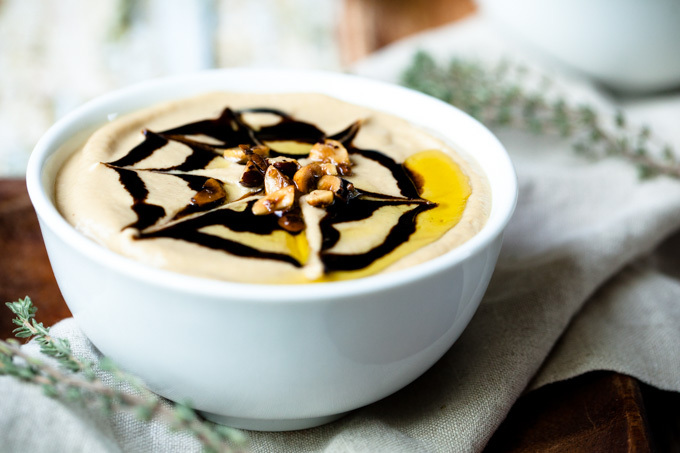 Divide the soup into 2-3 bowls and garnish with balsamic glaze, olive oil, and toasted hazelnuts. *Balsamic Glaze (also called Balsamic Drizzle or Reduction) is sold in many stores near the salad dressings or sauces. You can also make your own by combining 4 parts balsamic vinegar to 1 part agave nectar and simmering on low heat for 30-40 minutes. *Toast hazelnuts with a small amount of oil on low heat for 2-3 minutes until golden brown. *Serves 4 as a side, 2 as a main. We love connecting with you! Come say hi on Facebook, Pinterest, Instagram, and Twitter! HI, better not peal the sunchokes but brush the skin of with a metal sponge. Easy! About how many servings does this recipe make? I have a whole load of sunchokes from my sister’s garden and am not sure how many times to multiply the recipe. This recipe serves two as a main or four as a side. I’ll update the recipe to include that info. Hope you love it! The dish is great, though in my case it was definitely more like a puree than a soup! I added another cup of vegetable broth to thin it out and it will still pretty thick! But this is delicious! Happy I tried!